The liverworts (or Marchantiophyta) are descendants of the earliest terrestrial plants. The group is characterised by morphological simplicity, and this is matched by simple underlying genome structures. Many lower plants, including liverworts, demonstrate a striking tolerance of extreme stresses, a trait that would be valuable in a production system. Liverworts have been a largely neglected area of plant biology, but show promise as new experimental systems after recent developments in transformation methods and genome characterisation. 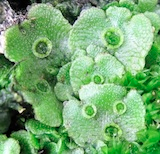 Marchantia polymorpha is the best characterised liverwort plant. It is a common weed, and can grow quickly and resiliently. 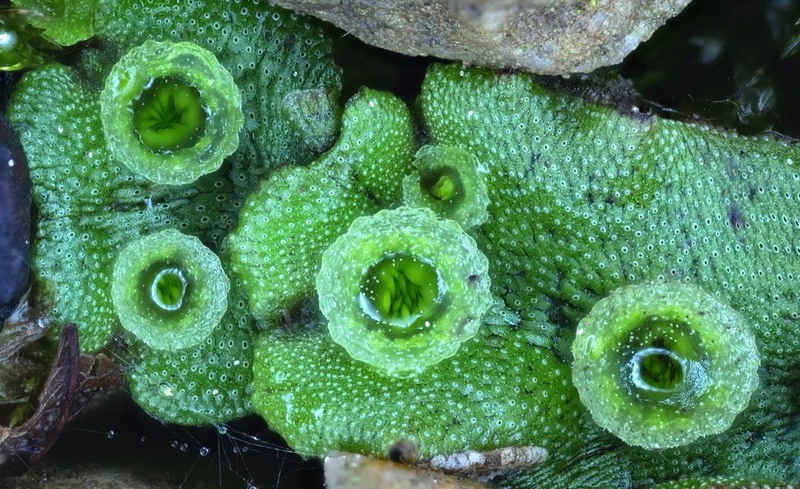 The relative simplicity of genetic networks in Marchantia, combined with the growing set of genetic manipulation, culture and microscopy techniques, are set to make this primitive plant a major new system for analysis and engineering. We aim to establish Marchantia as a testbed for plant synthetic biology, which will provide a prototype for other OpenPlant initiatives in higher plants. Our aim is to exploit the extraordinary experimental properties of Marchantia, and produce systematic collections of (i) experimental protocols and (ii) shared DNA parts. This will include a comprehensive collection of promoters, selection markers, and fluorescent and bio-pigment reporter genes. In addition, (iii) we will produce and distribute Marchantia lines with integrated cell fate markers in order to track physiological and morphogenetic changes. We will distribute information using laboratory-based web sites and specialised DNA registries, and distribute DNAs and plant material via stock centres. Synthetic Biology is an emerging field that employs engineering principles for constructing genetic systems. The approach is based on the use of well characterised and reusable components, and numerical models for the design of biological circuits – in a way that has become routine in other fields of engineering. Synthetic Biology is providing a conceptual and practical framework for the systematic engineering of gene expression and behaviour in microbes, facilitating the design of novel regulatory networks, including synthetic oscillators, switches, logic gates, intercellular signaling systems and metabolic pathways. Synthetic Biology approaches also show great potential for the engineering of multicellular systems. (1) The greatest diversity of cell types and biochemical specialisation is found in multicellular systems, (2) the molecular basis of cell fate determination is increasingly well understood, and (3) it is feasible to consider creating new tissues or organs with specialized biosynthetic or storage functions by remodelling the distribution of existing cell types. Of all multicellular systems, plants are the obvious first target for this type of approach. Plants possess indeterminate and modular body plans, have a wide spectrum of biosynthetic activities, can be genetically manipulated, and are widely used in crop systems for production of biomass, food, polymers, drugs and fuels. Commercial practices in the biotechnology field have restricted the free exchange of materials and resources. Restrictive licensing and materials transfer agreements are routinely (and understandably) used to protect and foster investments in companies and academic institutions. However, Synthetic Biology approaches are based on the standardisation and exchange of parts for biological construction. This might be in the form of actual DNAs, or as data for DNA synthesis of the part or circuit. There are many benefits that would accrue with a shift to a more free environment for exchange. A number of us in the field support the BioBricks Foundation (http://bbf.openwetware.org), which is an attempt by the Synthetic Biology community to draft new licensing agreements and frameworks for free exchange of parts - where these would be distinguished from applications, which could be protected in the normal manner. Renewable technologies are inherently low cost, and have the potential to reduce unfair differences between developed and developing societies, but only if the technologies can be easily transferred. These issues are particularly relevant for the plant field, where studies of plant development are likely to contribute to trait improvement in crops and better forms of bioproduction - that will need to underpin the ongoing shift to sustainable technologies. Current GM crops generally possess new traits conferred by single genes, and expression results in the production of a new metabolic or regulatory activity within the context of normal development. However, cultivated plant varieties often have enlarged flowers, fruit organs or seed, and are morphologically very different from their wild-type ancestors. Recent genetic studies have provided detail of the molecular processes underlying plant development. The next generation of transgenic crops will contain small gene networks that confer self-organizing properties, and the ability to reshape patterns of plant metabolism and growth. The ability to assemble new feedback regulated genetic circuits and developmental regulators in planta will allow the engineering of stable new patterns of gene activity, and targeted reprogramming of the number and arrangement of cell types in natural organ systems. Misregulation of key transcription regulators can promote or repress the formation of particular cell types, and coordinated misexpression can result in the ectopic conversion of cell fates. This would provide a means to modify plant form and biosynthetic activities, with the ultimate prospect of producing neomorphic structures suited to bioproduction. Marchantia is a liverwort, which were among the first terrestrial plants. The dominant form of the life cycle is haploid. The plants are commonly found as weeds in horticultural nurseries. They reproduce vegetatively and via spores. Marchantia polymorpha is becoming a major new system for developmental biology - it can be easily transformed and regenerated. The genome is currently being sequenced, and its gene organisation appears highly steamlined with little genetic redundancy.